Galaxy M83 (NGC 5236) is a face-on spiral galaxy with a starburst in its nuclear region and active star formation occurring throughout its spiral arms. The M83 mosaic project, led by William Blair (Johns Hopkins University) and archived as a High Level Science Product at MAST, created mosaics spanning seven fields using WFC3-UVIS and WFC3-IR. Two of the fields used in this project were obtained during Program 11360 (PI: R. O'Connell) in 2009, while the other five fields were obtained as part of Program 12513 (PI: W. Blair) in 2012. 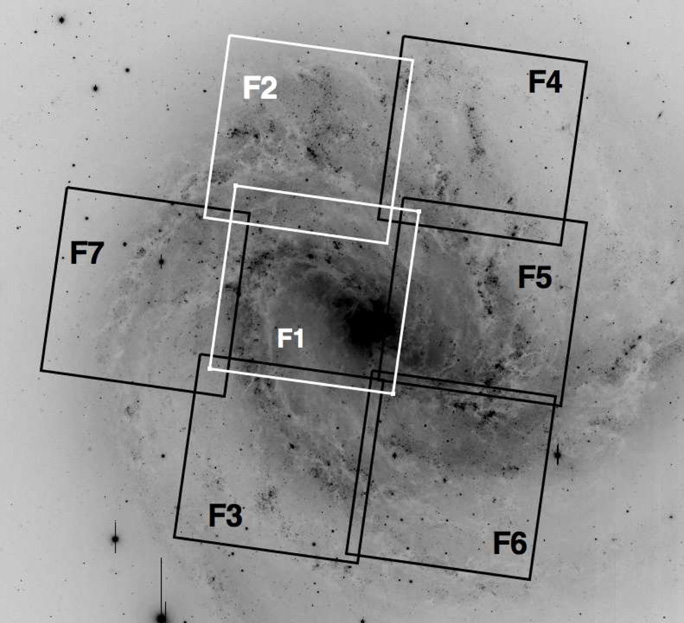 Each of the 15 filters across the seven fields are combined into a single mosaic of M83, although the Fields 1 and 2 include additional filters, and hence the mosaics for those contain only those two fields. All of the mosaics, however, are astrometrically aligned to a common reference. A combined mosaic using the F555W and F547M observations. Locations of the seven M83 fields. The white boxes (Fields 1 and 2) are archival fields from Proposal 11360, while black boxes come from Cycle 19 Program 12513. Fig. from Blair et al. (2014). For visual band coverage, Field 1 was observed with F555W while the rest of the fields were observed using F547M to avoid any potential emission-line contamination. Hence, the F555W mosaic only contains one field, while the F547M mosaic shows a hole where Field 1 should be. For convenience, there is also a mosaic combining the F555W and F547M filters into a single mosaic, where the F555W data were scaled to approximately match the F547M scaling. See the README file for more information. The FITS file names for the combined mosaic show the two filters joined by a hyphen. In addition to the mosaic FITS files, MAST also provides interactive displays that allow users to pan, zoom, adjust contrasts, create color images by combining the individual filter mosaics, and overlay source catalogs. You can access both by clicking on either the "FITS" or "Display" links above each image in the table below. You can use this link to use the Interactive Display to combine any of the single-filter mosaics from WFC3-UVIS and WFC3-IR into a color image: UVIS+IR. Note, though, that this can be a little slow when adjusting things like saturation. If you want to combine only three filters from UVIS or three filters from IR, then you should use these links, which can run faster: WFC3-UVIS, WFC3-IR. 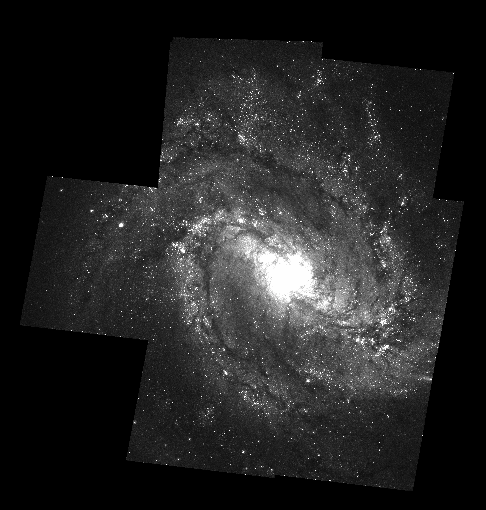 The observations from this HLSP were used as part of the Hubble Heritage project in 2014. You can find the original Hubble Heritage News Release here. You can also visit the Hubble Heritage supplemental page for an interactive, zoomable, full-color mosaic of the entire galaxy here.